Floor Standing and taller version of our deep padded Tamar Headboard. Vertical buttoned detail, 10cm / 4" high pillow board which allows the pillows to sit snugly with the headboard, and with self-coloured edge trim detailing. Available in our full range of Upholstered and Faux Suede fabrics. Not available in Faux Leather fabric. Also available with optional diamante buttons for an extra special finishing touch. Just contact us to add this option. All of our Fabric Headboards are available in all UK Standard bed base sizes; 2ft6 Small Single, 3ft Single, 4ft Small Double, 4ft6 Double, 5ft King Size, and 6ft Super King. Note: Main image displays this headboard in Shetland Navy and Shetland Red Trim and buttons. Unless noted as 'In Stock' above, all Swanglen Headboards and Furniture products (Excluding Divans) are Made to Order in the UK, with a lead time of up to 10-15 Working Days (2-3 Weeks). 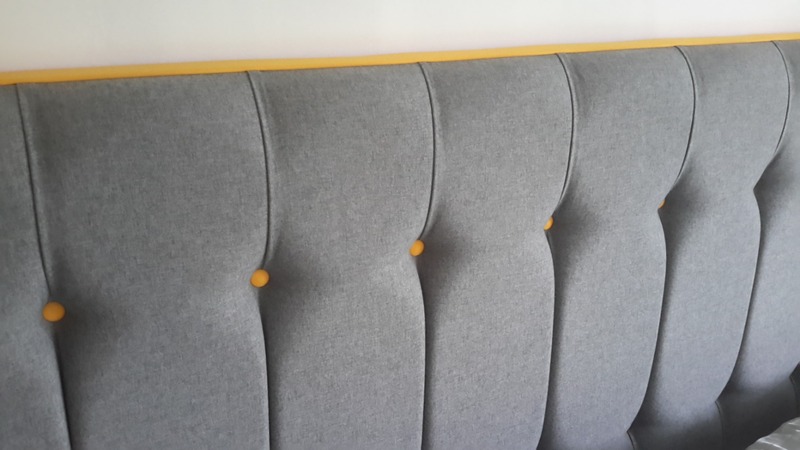 Very pleased with the quality and price of this headboard. Will strongly recommend the company for the calibre and value of its products.I will definitely use them again. Generally I don't do reviews but this is totally worth the bother. Fantastic quality; literally as good as the photos - which isn't often the case. I contacted the company about the delivery time and they were very fast responding, then I needed it delivered to a neighbour and they changed that correctly too. First class service and great value. Apart from the weight which feels like half the slate from Wales was in it, don't try and get this upstairs on your own. The finished article is superb and would recommend it to anyone.